FACT CHECK: Did a 'West Virginia Republican' Tell Women to 'Get Your Coat Hangers Ready' ? Parkersburg City Councilman Eric Barber made the "coat hanger" comment in a reply to a Facebook post about Brett Kavanaugh's Supreme Court confirmation. 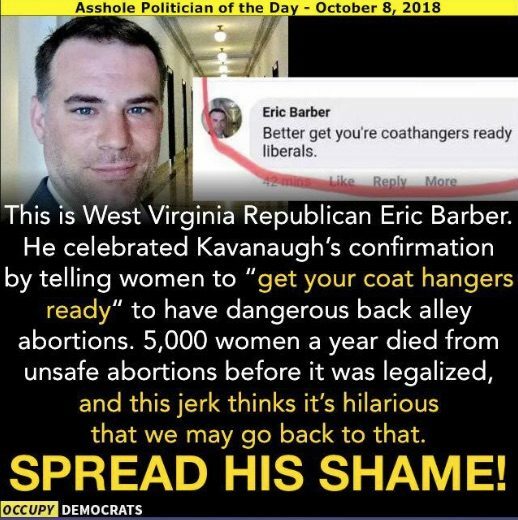 Republican Eric Barber "celebrated" Brett Kavanaugh's Supreme Court confirmation by telling women to "get your coat hangers ready." Parkersburg, West Virginia, city councilman Eric Barber wrote, “Better get you’re [sic] coathangers ready liberals” in reply to a Facebook post upon news that Democratic senator Joe Manchin of West Virginia would cast a tie-breaking "yes" vote to confirm Brett Kavanaugh to the Supreme Court. Barber isn't a Republican in terms of his official capacity on the Parkersburg City Council. He changed his political party affiliation in October 2017 from Democrat to "none." As is often the case, the meme was intended to generate agitation among its intended target audience, but in this case it wasn’t quite accurate. Eric Barber is a City Councilman representing District 4 of Parkersburg, West Virginia, a municipality with a population of roughly 30,000. In his official capacity as such, Barber is not a Republican. The comments were posted to a Facebook group dedicated to discussion of local events in the Mid-Ohio Valley region. We reached out to Barber for comment and received no response, however in an interview with the Parkersburg News and Sentinel, Barber confirmed he wrote the comments. Barber was elected to the City Council in January 2017 as a Democrat. In October of that same year, he changed his party affiliation to “none” (i.e., unaffiliated), citing disagreement with former Wood County Democratic Executive Committee chair Daryl Cobranchi over a non-discrimination ordinance and what he termed “anti-Christian rhetoric.” The Wood County Clerk’s Office confirmed to us on 9 October 2018 that Barber still has not declared any party affiliation. Barber said he was referring to an incident when he was in Washington, D.C., and Kavanaugh’s nomination was announced, something he posted about on his Facebook account in July. He said he went to the Supreme Court building, where anti-abortion and abortion rights groups were demonstrating, and a woman threw a wire coat hanger in his face, apparently in reference to what could happen if, as some fear, Kavanaugh is part of a judicial majority overturning or limiting the 1973 Roe v. Wade decision that legalized abortion. Barber told the newspaper he has received death threats and hate mail as a result of the post and the rash of viral news stories that brought national notoriety to the relatively small locality. 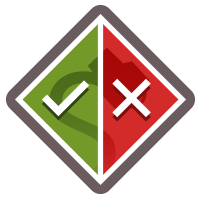 Barber’s post referenced a dangerous method of performing self-induced abortions that has become synonymous with the idea that elective medical abortion procedures could become illegal again in a post-Roe v. Wade era. Kavanaugh’s confirmation process was extremely contentious and fraught with partisan mudslinging over opposition fears that he could provide the swing vote to overturn Roe v. Wade. The Parkensburg News and Sentinel. 9 October 2018. < em>The Parkensburg News and Sentinel. 13 October 2017. Friendly Atheist. 9 October 2018. The Guardian. 15 December 2015. USA Today. 7 October 2018.